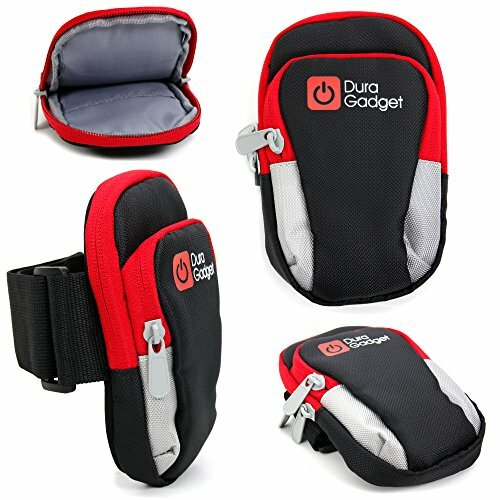 Introducing DURAGADGET's brand new and exclusive polyester sports armband case, with a striking black, red and silver design and a silky smooth finish. Our limited edition case features two durable, zipped pockets for storing your gaming mouse, other small devices or keys whilst on the go for ideal, hands-free use. Inside the larger section of the case, there is a smaller slip pocket for keeping bank cards or small change separate from your device, avoiding any scratches to it. The smooth, padded nylon lining of the pockets will keep your smartphone's screen protected from scratches and bumps that could damage your device. The back of the case is made from a soft, padded, neoprene material for next-to-skin comfort and features a built-in nylon, adjustable Velcro strap that can be customized in size, accommodating any padded or protective clothing that you may be wearing. This also offers anti-slip, anit-shake stability. Lightweight, flexible & ultra-portable, this sports armband is the ideal accessory to use in the gym, whilst out running, cycling, etc.